Final day and lets make some cake which is not a flour-based but a rice cake. Last time I posted a recipe called cassava cake, it was good but it’s more suited for people who like their cassava cake firm. So for this post we will do the soft and chewy version of this popular Philippine snack / dessert and what’s the best way to do it is to wait! Yes I will just wait because my mom is in New Zealand at the moment for the holidays so might as well make good use of her stay by asking her to cook some of my favourite dishes she prepared when I was younger, those dishes that I miss. This is one of them. So this I will call it “The mom’s version”, the texture of it is different from my original post as this is soft and chewy. Now for those who want to try it or looking for this recipe you have two choices on what suits your preference the soft and chewy or the firm version. In a large mixing bowl combine all Cassava Cake ingredients; mix thoroughly until even in consistency. Pour cassava mix in a greased baking tray, spread macapuno on top then bake in a 180C preheated oven for 45 minutes. While baking in a sauce pan mix together topping ingredients, mix thoroughly until even in consistency. Cook in low heat until sauce thickens. Remove cassava cake from oven then pour sauce on top, distribute evenly then place back in the oven and bake at 220C for 15 more minutes or until top turns golden brown. Cassava cakes are the best!! I definitely vote for “soft and chewy”! I bought some grated cassava a while ago but have been kinda lazy to bake it. lol.. It’s still sitting in my freezer now. Your cassava cake looks delicious!! I love it!! We grow cassava in my island and yet I’ve never tasted it. What’s it similar to? I know it looks like a sweet potato or Caribbean yam but texture or taste wise, what’s it close to? This cake looks fantastic by the way. Even without knowing what cassava tastes like, I’d want a huge chunk of this. I’ve never tried cassava. This dessert looks like heaven! i never had cassava, but this looks so delicious i need to find some! Eto b yung gawa ni mommy bro nung pasko? Sarap!! 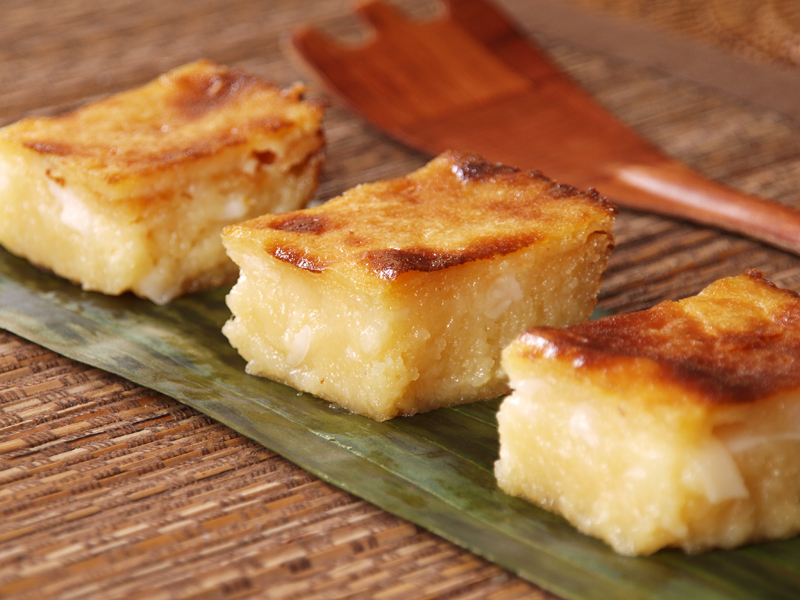 cassava cake is my favorite…i will bookmark this and try this recipe one day. I can’t wait to try this. I had the other version bookmarked but love the idea of making it soft and chewy. Mmm I’ve never tried either but I am guessing I would prefer the soft and chewy version? This is my favorite cake of the ones you posted! It look delicious! I would love to try some! Masarap na kakanin yan, we called it “Budin”. Yes thats true, your croquette! Looks nice and yummy. I will try to cook it. Raymund!!! What size baking tray did you put this in? 9×9?? I’m thinking of making half this portion. Thanks Raymund!! I made this and it turned out soooooooo delicious! LOVE IT! Hi I live in Taupo. Could someone tell me where I can get Cassava so I can grow it here? I am not sure if it would survive NZ weather as it is a tropical root crop, anyways you can buy them in Asian Shops (here in Auckland not sure in Taupo) already grated. I made the soft & chewy cassava cake last weekend. It’s perfect even though I don’t have the shredded cheese. thanks for the recipe. love to try this recipe! Hi, the cassava cake is really delicious. I enjoy it. We grow some cassava plant in our backgarden, so i use raw cassava everytime. I will give you an easy microwave recipe which taste great. Grate and grind the cassava in a puree form adding little water . Add sugar , powdered milk, a little butter,vanilla essence and mix. Pour the mixture in a buttered microwave bowl . Cook on high for 3 mins. Allow to cool for a few mins and cut into squares. Spinkle some dry coconut powder and ready to eat. hi do you grate your own cassava or do you use the frozen ones sold in asian shops? if you do, once thawed, do you drain the liquid or use everything? thanks in advance. We used the frozen grated ones and we used it as is after thawing, meaning we did not drain it. The one I use here is 400ml for coconut milk, 375ml for evap, and 395g for condensed. can i use cassava flour? When I read this recipe, I remember my cassava cake in the fridge. I put butter in my recipe, it’s sooo yummy. I’d cooked last week and gave some to our Kiwis neighbor next door and they’d love it. HI! is it okay to use the fresh coconut milk instead the canned? thanks! We used a 15×10 inch pyrex baking dish. For the topping, did you use half of the big can of condensed milk? Hi I have a bag of frozen cassava but it is not grated. Can I just cut in chunks and puree, then use it? Do I need to thaw it? I have never used cassava but want to try and this is all that the store had. Do not puree them just grate them using a fine grater or use the fine grater in a food processor. Hi, can I use Cassava flour? Sorry buy you cant, theres no substitute for grated cassava. Never made cassava pudding/cake myself because my late nanny always made it for the family. But now that I’m on my own and living abroad, I’m thinking back on the good old homemade foods I love. But reading on cassava, I never thought it was toxic if not prepared properly. So if I am gpoing to make cassava cake by grating it, do I…. as some online article3s propose…. have to pre-soak the grated raw cassava first before using it in the cake mix? If yes, for about how long do you think? Thanks for any advice…. If you are using the fresh ones make sure the skin and the thick layer beneath it is completely removed. If you notice after the brown skin there is another layer roughly 3mm in thickness, that need to be removed as my grandmother always tell us. Also please make sure it is well cooked as the cooking process they say remove the toxins. As for the pre soaking I am not sure about this one, I never seen my grandmother do this before, also there are frozen ungrated cassava that are sold in Asian shops and I used them without pre soaking and consumed the whole thing without grating. I love Cassava but have always been curious as to how would you store the delicious cassava treat? Leave it out at room temp or put it in the frig? Thanks. What kind of grated cheddar cheese did you use? I’m based in Canada and cheddar cheese here have different kinds… Usually they’re harder than our cheddar cheese in Philippines (like the kraft cheddar cheese in PH)… Should I look for a softer kind of cheddar cheese? Softer cheddar would be the most appropriate one, you can also use colby. is it ok if no macaponu and sugar? hav u tried this if how does it tastes? I saw your bibingkang malagkit recipe and saw this too. I’ve tried to make cassava cake many times but I’ve never managed to make an edible version of it. Somehow mine always ends up being too watery or too hard. Maybe it’s my ancient oven. I’ve given up. Fortunately the Filipino Community Centre here in Vancouver Island sells this during the annual Filipino Food Fiesta. I just line up early and buy as much as I can so I can.